Photo: A monument of Candido in the plaza of Lilo-an, Malinao [credit: National Commission for the Culture and the Arts]. ​Candido was captured and faced a Spanish firing squad. He was first imprisoned in Kalibo, and, from the prisoners, 19 were handpicked to face execution without trial. Candido and 18 other members of his freedom fighting patriots were shot on March 23rd 1897. They became known as the 19 Martyrs of Aklan. Just over one year later, on 8th June 1898, Filipinos proclaimed their independence from Spain. Let us not forget those freedom fighters who fought valiantly for their beloved homeland of the Philippines so as to enable the people of the Philippines to be free people today. Happy Philippine Independence Day 2018. Winning the lottery can change one's life. It definitely had a major impact for Candido Iban, son of a lowly farmer, as well as for the Filipino independence fight at the turn of the 19th and 20th centuries. Candido was born in Lilo-an, Malinao, Aklan on Oct. 3, 1863. He had adventure in his blood. As an adult he first moved from Aklan to work as a sugar laborer in IIoilo and then to Negros in the Philippines. ​After this he travelled to Australia to work as a pearl diver with his friend Francisco Castillo (Francisco del Castillo). It was in northern Australia as an Overseas Filipino Worker (OFW) - possibly one of the first few Filipino OFWs known as Manila Men to work in Australia - that Candido won the lottery. This was around the same time as the Philippines' fight for independence from the Spanish colonial empire. Candido, with his OFW friend Francisco, travelled back to the Philippines and became instrumental in the fight for Filipino freedom. Candido used his lottery winnings to buy a printing press for the Katipunan revolution. Both Candido and Francisco were killed by the Spanish. Photo: A statue in honour of the 19 Martyrs of Aklan in Kalibo where the freedom fighters were executed by the Spanish. 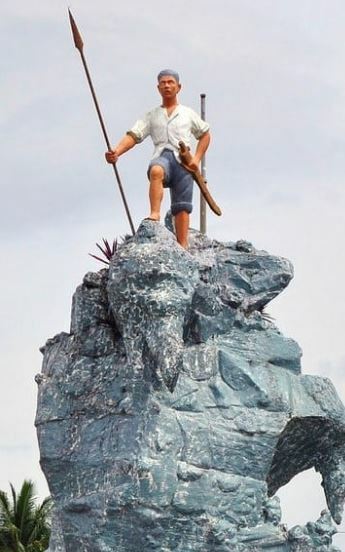 This statue is one of the Philippines' freedom shrines. Photo: Children running with a Philippine flag, representing proud independence and self-determination for the Philippines, representing Filipino people in the Philippines as well as the large diaspora of proud Filipinos living around the world who still call the Philippines their motherland.